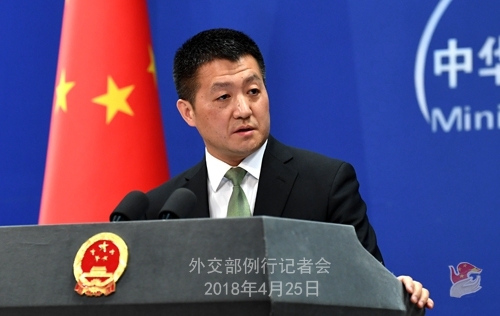 April 26, 2018 -- China firmly opposes the China-related content in a joint communique issued by the foreign ministers of the Group of Seven earlier this week, saying it is untrue and irresponsible, a Foreign Ministry spokesperson said on Wednesday. Spokesperson Lu Kang made the remarks at a routine news briefing when answering a related question. The joint communique is being masqueraded under the name of international law, and is pointing fingers at the South China Sea and East China Sea issues, as well as China's human rights situation, Lu said, stressing that China firmly opposes the untrue and irresponsible remarks in the communique. He said China's attitude towards maritime issues is clear and consistent. China has always been committed to properly handling and resolving disputes through dialogue and consultation with the countries directly involved, advancing cooperation in various areas, and jointly safeguarding peace and stability in the South China Sea and East China Sea, as well as the freedom of navigation and overflight and security of navigation channels. The Chinese government has always attached great importance to developing human rights and has made great achievements that have attracted worldwide attention, said the spokesperson. China urges all countries to respect objective facts, respect the efforts of regional countries in maintaining stability and enhancing cooperation, and stop making irresponsible remarks. "We urge these countries to abandon their ideological prejudice, view the development of human rights in China objectively and justly, and stop using this excuse to interfere in China's internal affairs," Lu said.